Although most people think of magnolia as a southern tree, some species of the plant will grow as far north as USDA Zone 4, while others are native to Asia, the West Indies and Central America. Magnolias range in species from deciduous to evergreen. If a magnolia is losing its leaves, it may simply be undergoing a seasonal shedding, or it may be indicative of a larger problem. Look at a calendar to determine the time of year your leaves started falling. Many species of magnolias such as southern magnolia or sweet bay magnolia drop leaves in spring to make room for new leaves. Examine the branches of your magnolia tree. Insects such as scale or ash whitefly can cause a magnolia’s leaves to turn yellow and fall off from feeding. Scale bugs and ash whiteflies secrete a clear, sticky, sugary substance known as honeydew. This substance will coat the leaves and branches of a magnolia. The honeydew is a breeding ground for sooty mold, which looks like black charcoal dust and can blanket the leaves and twigs of a tree wherever the honeydew appears. If you see honeydew or sooty mold on the remaining leaves and branches of your tree, this is an indication of scale bugs. Honeydew and sooty mold may be washed off of magnolia trees. For long-term prevention, the trees should be sprayed with insecticidal soap from a garden hose to kill insects that secrete honeydew. Pick up a dropped leaf and examine it. Diseases like leaf spot or infestation by algae often cause a magnolia tree to lose leaves prematurely. The leaves will often show the signs of the disease on them. For example, magnolia leaves affected with black leaf spot will have black spots on them, while leaves infested with algal leaf spot will be stippled with raised gray-green spots. To treat fungal or algae spots, spray the tree with an application of fungicide. Inspect dropped leaves for yellow margins with green veins. This can indicate an iron deficiency in the soil. To amend the soil, drill holes into your soil with a soil augur around the drip line of your tree to avoid damaging the roots of the tree. These holes should be 2 inches wide and 18 inches deep. Each hole should be 24 inches apart. Fill each hole with a mixture of iron sulfate and elemental sulfur up to about 4 inches from the hole's surface. The nutrients will disperse into the soil and the tree will absorb them. Touch the branches of trees in which leaves are falling. Magnolia canker and scab leave lesions and holes in the bark of the tree. Verticillium wilt will cause the leaves and branches of a tree to collapse. Cankers and scabs are caused when fungus grows between the magnolia's trunk and the bark. The bark separates from the trunk and dies. To repair the tree, prune away the cankered or wilted wood. Nurture the tree through the wilt with an application of fertilizer around the drip line of the tree. You can also kill fungicide with a fungicidal spray. Pull apart matted, dead leaves to determine if they are stuck together with tiny fungal threads. These threads may resemble spiderwebs. If so, your tree suffers from leaf blight. Leaf blight is a fungal disease that must be treated by first removing the affected limbs with pruning shears and then spraying the tree with a fungicide. Take your leaf (sealed in a freezer bag) to your nearest county extension service. 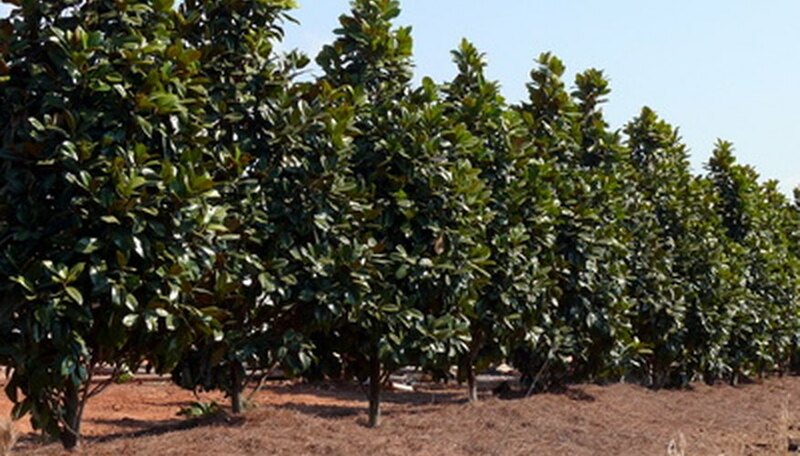 An agent with the service will be familiar with which problems are affecting magnolias in your area and can help you to determine what is wrong with your magnolia tree.